On Wednesday, August 15th, all drafted players who went the NCAA route and graduated this spring will become free agents if they remain unsigned by the team that holds their NHL rights. Unlike the last couple of summers, which featured names like Will Butcher, Alexander Kerfoot, Jimmy Vesey and Matt Benning, there is no standout name in this year’s class of late summer college free agents. However, as of now, CapFriendly reports that 16 players are set to hit the market next week. Some of them will not be in search of an NHL contract. Brown forward Max Willman was granted an additional year of NCAA eligibility due to injury and has committed to Boston University next season as a graduate student-athlete. UConn’s David Drake has already worked out an AHL deal with the affiliate of the team that drafted him, the Philadelphia Flyers, and Wisconsin’s Matt Ustaski has a similar arrangement with the Winnipeg Jets. Cornell’s Jared Fiegl and Dwyer Tschantz have already accepted their place in the pro hockey hierarchy and signed ECHL contracts. All of these players can technically sign with an NHL team after August 15th, but it is unlikely. The New York Rangers have avoided arbitration with one of their restricted free agents, signing Jimmy Vesey to a two-year contract worth a total of $4.55MM. Vesey was scheduled for an arbitration hearing on July 30th, which will no longer be necessary. Vesey, 25, probably has more name recognition than most middle-six wingers in the league that are coming off back-to-back seasons with fewer than 30 points. That’s because of the saga that unfolded in the summer of 2016, when Vesey told the Nashville Predators he wouldn’t sign with them coming out of college. Even after trading a third-round pick for his rights the Buffalo Sabres couldn’t convince him to sign, and Vesey eventually became an unrestricted free agent. Despite connections to the Boston Bruins and Toronto Maple Leafs, a then 23-year old Vesey decided to sign with the New York Rangers and was immediately inserted into their lineup. In the two years since exiting Harvard following his Hobey Baker-winning season, Vesey has scored 33 goals and 55 points in 159 games. While that is fine production for a player that cost the Rangers nothing but an entry-level contract, it’s not quite what people were expecting when he was one of the most talked about stories of the 2016 offseason. There’s an obvious knack for goal scoring in Vesey, but there hasn’t been a consistent enough offensive or defensive presence to really consider him a key member in the Rangers’ quick rebuild. Instead he presents as a secondary scoring threat that is valuable and now reasonably priced at an average annual value of $2.275MM. If Vesey is to really live up to the hype that surrounded him two summers ago, he’ll have to do it quickly before several younger prospects really make their mark and start demanding minutes with their on-ice play. Filip Chytil and Lias Andersson both received a taste of NHL action last year but could be full-time options for the team this season, while others like Brett Howden and Vitali Kravtsov aren’t far behind. Vesey will be an unrestricted free agent once again at the end of this two-year deal, meaning if he doesn’t show enough to justify a long-term contract this season he could find himself on the trade block at some point. Free agency is now a little less than a month away from opening up and there are quite a few prominent players set to hit the open market while many teams have key restricted free agents to re-sign. Here is a breakdown of New York’s free agent situation. Key Restricted Free Agents: F Vladislav Namestnikov – The Rangers have plenty of restricted free agents to sign this summer, and while Kevin Hayes and other forwards may have had a bigger impact on the team, it’s Namestnikov that remains the biggest enigma. After coming over from the Tampa Bay Lightning at the deadline as part of the Ryan McDonagh trade, Namestnikov failed to find much chemistry with his new team. The 25-year old registered just four points in 19 games down the stretch, after notching 44 in Tampa Bay (mostly alongside Steven Stamkos and Nikita Kucherov). Those 44 had already guaranteed he would reach a career-high in points, and he had already cracked 20 goals by the end of February. There is still some question as to where he fits into the Rangers plans though. As the team continues to try and get younger, they essentially swapped two players the same age when they sent J.T. Miller along with McDonagh to Tampa Bay. Now Namestnikov, the 27th-overall pick from 2011, will have to show that the team actually upgraded with that trade and show he can be a top-six contributor in 2018-19 and beyond. Since he’ll be turning 26 in November any long-term deal will be buying out several unrestricted free agent seasons, substantially increasing the cap hit of the overall deal. After being paid an average of just $1.94MM the last two years, Namestnikov will be looking for a substantial raise. It’s not clear if New York wants to commit long-term to a player that has had trouble producing when not playing alongside elite linemates. D Brady Skjei – If Namestnikov is the most unclear decision on the team’s RFA list, Skjei might be the most important. The 24-year old turned into one of the team’s most reliable defensemen in the second half of 2016-17, and showed again that he could be a big time contributor this season. 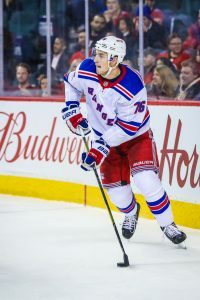 Though his point production dropped significantly, Skjei was asked to log more than 21 minutes a night for a team whose defensive unit was constantly in flux. 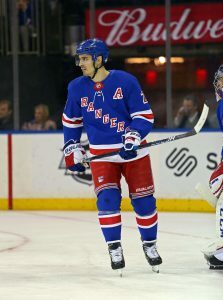 McDonagh was traded midseason, Kevin Shattenkirk dealt with injury and Brendan Smith was banished to the minor leagues, leaving Skjei the lone defender who could be counted on all season. Skjei is coming off his entry-level contract later than many other impact players, meaning that he’s closer to unrestricted free agency than many would be heading into their second deal. It’s clear that he is a player to build around for the Rangers, and signing him long-term right now is the only way to really keep his cap hit to a reasonable amount. If the team (or player, for that matter) decides to mitigate risk and sign a short-term bridge deal, it could end up costing them in the long run if Skjei continues to improve and looks for a big-money extension when he’s 26 or 27. Key Unrestricted Free Agent: G Ondrej Pavelec – The Rangers sold hard at the deadline to rid themselves of nearly all valuable unrestricted free agents, leaving Pavelec as the last remaining big ticket. The team does have other potential internal options as a backup for Henrik Lundqvist, but there’s not much to complain about with their situation this year. Pavelec recorded a .910 save percentage in 19 games, and though his record was poor that’s more a reflection on the team in front of him than his performance. The former Winnipeg Jets goaltender signed for just $1.3MM this season, and could likely be brought back for a similar amount in 2018-19. Otherwise, Pavelec would likely have several suitors around the league as a reasonably priced backup with plenty of experience. The 30-year old goaltender has played 398 games in the NHL, and could come in as a 20-game backup for one of the more established goaltenders in the league. There is also always a chance he could return to the Czech Republic as a starter, though it’s been more than a decade since he played there full-time. Projected Cap Space: The Rangers currently project to have somewhere around $30MM in cap space to spend this summer, but a lot of that will be eaten up by the group of RFAs requiring new contracts. If every one of Skjei, Spooner, Hayes, Vesey and Namestnikov are signed, the team could be looking at a lot less room to operate with for the rest of the summer. The idea that they’ll just re-sign what they have and go into next season with the same group seems foolish, especially with young players like Filip Chytil and Lias Andersson knocking down the door. With three first-round picks and plenty of young prospects starting to fill the cupboards, it wouldn’t be surprising if New York was one of the most active teams this offseason. Either continuing to trade experience for youth and building towards a window of contention in a few years, or reloading to get back to the playoffs in the short-term, the Rangers are a team to watch closely as the draft approaches in a few weeks. The Toronto Maple Leafs are comfortably in a playoff spot in the Atlantic Division, sitting fifteen points up on the Florida Panthers. As they try to catch Boston or Tampa Bay down the stretch for home ice advantage, head coach Mike Babcock clearly wants some help at the trade deadline. As Chris Johnston of Sportsnet reports, Babcock has let “the people who need to know, know” what he’d like to see added. In his latest 31 Thoughts column for Sportsnet, Elliotte Friedman mentions three names on the Maple Leafs that could easily be removed in the next few weeks instead. Josh Leivo, who has asked for a trade after being passed over again for playing time, Nikita Soshnikov, who will force the Maple Leafs into a roster move once he completes his conditioning stint, and Matt Martin. Martin has two more years on his contract at $2.5MM per season, but hasn’t been able to crack the lineup recently and could be moved to create some roster flexibility. As the New York Rangers prepare to sell off some assets at the trade deadline, they got some good news on the injury front today. While Marc Staal was absent from practice due to a neck injury, Jimmy Vesey (concussion), Pavel Buchnevich (concussion) and Chris Kreider (blood clot) all skated. Kevin Shattenkirk, who underwent knee surgery a few weeks ago, is now off crutches. Amazingly, the Rangers are still just three points out of a playoff spot in the Eastern Conference, and with some returning players and new blood there is no telling what could happen in the latter part of the season. Craig Button and TSN have released their ranking of the top-50 prospects that have already been drafted, with Elias Pettersson coming in at the very top. The Vancouver Canucks first-round pick has been arguably the best player in the SHL this season with 45 points through 35 games and looks poised to make an impact in North America as soon as next season. Beyond that is Eeli Tolvanen at #2, despite falling nearly out of the first round entirely last June. Tolvanen turned a disappointing decision at Boston College into an opportunity, and has broken nearly every record for an 18-year old player in the KHL. The entire list is interesting, and is quite different than Corey Pronman’s ranking at The Athletic (subscription required) which had Casey Mittelstadt in the top spot. The New York Rangers today confirmed that forward Jimmy Vesey is dealing with a concussion, and isn’t practicing with the team. The team was also without Marc Staal at practice with a cervical strain, while Pavel Buchnevich deals with a concussion of his own. If there was any doubt that the Rangers would be sellers at the deadline, the piling injuries may just erase it. The team is back in action against the Dallas Stars tonight, but will have to decide how long to wait before selling off assets like Rick Nash and Michael Grabner. It could be a very different looking Rangers team in the next few weeks. Though Phil Kessel missed practice with an illness, the news isn’t as good on Patric Hornqvist. The Pittsburgh Penguins announced that the high-energy forward will be out on a week-to-week basis with a lower-body injury, removing him from the lineup for the time being. Hornqvist will become an unrestricted free agent this summer, and may be on his last chance to suit up with the Penguins. After three straight 20-goal seasons, Hornqvist sits at 16 this year and will head into the summer with plenty of interest in his services. Kris Versteeg was on the ice today for the Calgary Flames for the first time since hip surgery in December. Versteeg still isn’t expected to be ready for game action for a few weeks, but getting him on the ice is a good first step. The 31-year old had just eight points in 22 games when he elected surgery, but could be an important piece down the stretch for the Flames.